While trying to break a fall with your hands may seem instinctive, the force of the fall could travel up your forearm bones and dislocate your elbow. It also could break the smaller bone (radius) in your forearm. 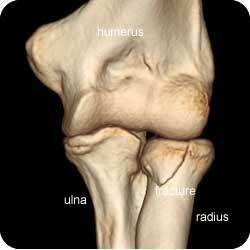 Fractures of the radius often occur in the part of the bone near the elbow, called the radial "head." 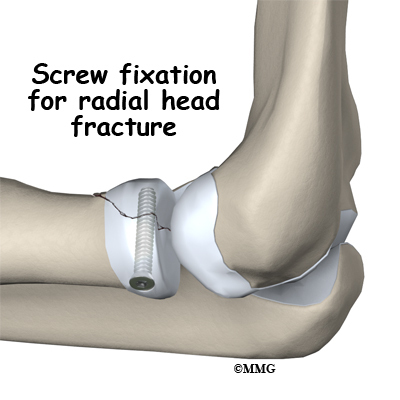 Radial head fractures are common injuries, occurring in about 20% of all acute elbow injuries. Many elbow dislocations also involve fractures of the radial head. Radial head fractures are more frequent in women than in men, and are more likely to happen in people who are between 30 and 40 years of age. The radial "head" is the knobby end of the radius where it meets the elbow. Doctors classify fractures according to the degree of displacement (how far out of normal position the bones are). Treatment is determined by the type of fracture, according to the classification below. Type I fractures are generally small, like cracks, and the bone pieces remain fitted together. The fracture may not be visible on initial x-rays, but can usually be seen if the x-ray is taken 3 weeks after the injury. Nonsurgical treatment involves using a splint or sling for a few days, followed by an early and gradual increase in elbow and wrist movement (depending on the level of pain). If too much motion is attempted too quickly, the bones may shift and become displaced. Type II fractures are slightly displaced and involve a larger piece of bone. If displacement is minimal, a sling or splint may be used for 1 to 2 weeks, followed by range-of-motion exercises. Small fragments of broken bone may be surgically removed if they prevent normal elbow movement or could cause long-term problems with the elbow. If a fragment is large and out of place enough, the orthopaedic surgeon will first attempt to hold the bones together with screws, or a plate and screws. If this is not possible, the surgeon will remove the broken pieces of the radial head. The surgeon will also correct any other soft-tissue injury, such as a torn ligament. Type III fractures have multiple broken pieces of bone which cannot be put back together for healing. In most Type III radial head fractures, there is also significant damage to the elbow joint and the ligaments that surround the elbow. Surgery is always required to either fix or remove the broken pieces of bone and repair the soft-tissue damage. If the damage is severe, the entire radial head may need to be removed. In some cases, an artificial radial head may be placed to improve long-term function. Early movement to stretch and bend the elbow is necessary to avoid stiffness. Even the simplest of fractures may result in some loss of movement in the elbow. Regardless of the type of fracture or the treatment used, exercises to restore movement and strength will be needed before resuming full activities.